A bill to require the removal of firearms from domestic violence calls if there is probable cause that a crime was committed passed out of the Senate Law and Justice Committee onTuesday. The bill was previously passed by the House of Representatives on March 5 with 60 voting in favor and 38 opposed, all those voting in opposition were Republicans. Prime Sponsor, Rep. Laurie Jenkins, D-Tacoma, testified in support of the bill on Monday, saying the main goal is to reduce the heightened risk to everyone involved by the presence of a firearm in a domestic violence call. A person is five times more likely to be murdered in a domestic violence situation if a firearm is present, said Jenkins. 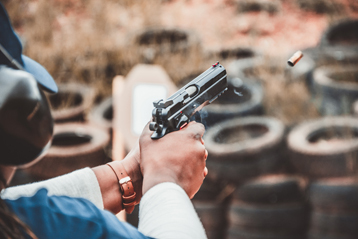 “In addition to the increased homicide risks, there is really strong evidence that batterers use firearms as kind of tools as terror and intimidation with regard to their children and there partners,” said Jenkins. Jenkins also cited a Washington State Institute of Public Policy finding that domestic violence is the greatest predictor of criminal acts and the single biggest predictor of violent crime of any kind. House Bill 1225 would modify existing regulations regarding the confiscation of a firearm in relation to a crime. Under current law, law enforcement agencies have notification protocols that allows family or household members to request notification when guns are returned. For the firearm to be returned under current law, it must be 24 hours from the time the firearm was obtained by law enforcement. HB 1225 would change that timeline in domestic violence calls to five business days. Law enforcement would also check that the individual is in compliance with state law and procedures regarding gun ownership eligibility, like background checks. Law enforcement would also be required to give victims of domestic violence legal rights and information on the ability to see an order to require the abuser to surrender firearms and concealed pistol licenses, along with prohibiting the abuser from possessing and accessing firearms. Pam Crone, of Washington State Coalition Against Domestic Violence, cited the data the group collects and analyzes on firearms in these situations in her testimony in support of the bill. Crone called the measures in HB 1225, “important life saving protections,” to not only victims but other individuals who could be at or involved in a domestic violence situation. Officers would also be required to separate the parties involved in the incident and ask whether there are firearms or ammunition in the home owned or possessed by either party, along with if coercive or threatening use of firearms has occurred in the past. The use or threat of firearms in the domestic violence incident would become part of the information considered concerning the defendant’s release or issuance of a no-contact order. David Martin from the King County Prosecuting Attorney’s Office testified in support of the bill. Martin used the supplemental form used at the over 10,000 domestic violence incidents in the county each year. The form has a group of firearm questions that are what Martin calls a “best practice,” that he says should be required state-wide. Logan Rysemus, experienced exual assault while in college, and now advocates for other domestic violence and assault survivors. “The most dangerous times for victims of domestic violence are when they are trying to leave a relationship and immediately following an arrest and the presence of a firearm can turn a volatile situation deadly in a fraction of a second,” said Rysemus. Sen. Mike Padden, R- Spokane Valley voted against moving the bill out of committee. Padden noted his concern that the victim would not be able to defend themselves without a firearm. Jenkins refuted the idea that keeping a firearm in the home or a domestic violence situation increases safety. “There is no evidence, there is none, that maintaining firearm availability in a domestic violence situation increases any safety for anyone. There is only evidence that it decreases safety,” said Jenkins. HB 1225 now moves to the Senate Rules Committee for consideration.